What Is the Maximum Age to Become an Officer in the Military? The maximum age for a commission is age 35. It is because a military officer must be able to have 20 years of service, to be retirement eligible for the maximum retirement age of 55. There are a few exceptions: Military medical officers and chaplains can be commissioned up to the age of 47 with waivers into their 50s (they also don't have to retire by age 55). Depending upon the need for doctors, psychologists, chaplains (all faiths), and legal officers as well, the maximum age can be waived. Those with prior enlisted service can receive waivers (as long as they can retire with 20 years of military service by age 55). Of course, there are exceptions to every rule as many senior officers serve well past the age 55 with 30 plus years of service. But typically with NO prior military service that age is 35 years old. Aviators (Pilots and Navigators) have different age requirements, which are specific to the service. Navy Officer Candidate School - ​OCS provides 13 weeks of officer candidate indoctrination and training. Selected enlisted members are designated officer candidates upon reporting to OCS in Pensacola, Fla.
Army Officer Candidate School - Army OCS is conducted at Fort Benning, GA and is 14 weeks long. Branches in which officers are trained vary according to the needs of the Army. These needs are greater in Combat Arms than in other branches. 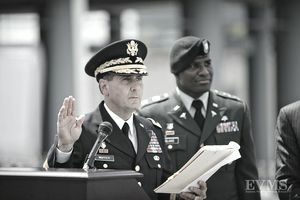 The Army requires all officer candidates to enlist into the Army prior to Officer Candidate School. Air Force Officer Training School (OTS) - The OTS complex is located in Maxwell Air Force Base, Alabama, and is a 14-week training program. USMC Officer Candidate School (OCS) - USMC OCS is located in Quantico, VA and is a 10-week course for college graduates of an accredited four-year college or university, and graduates of accredited law schools licensed to practice in a state or federal court are eligible for a reserve commission. Coast Guard Officer Candidate School (OCS) - Officer Candidate School is a 17-week course of instruction in leadership, management, navigation, law enforcement, and military subjects. The Coast Guard OCS program is located in New London Connecticut at the Coast Guard Academy. USN and USMC Limited Duty Officer (transfer) - There is a unique situation that can occur with Limited Duty Officers (LDO). LDOs are officers given commissions due to their skill and expertise in operations in the United States Navy or United States Marine Corps. A Limited Duty Officer does not have to have a bachelor's degree. However, should the LDO advance in his or her rank and finish college as well, they can transfer into the Unrestricted Line Officer ranks and continue their officer service for another 30 years if they choose. An LDO has some limitations. They cannot assume command, only achieving Executive Officer at the highest levels and finish promotions at O-5. However, with a transfer to Unrestricted Line Officer, they can continue their career into the flag ranks if they choose and are selected for such advancement during their long career. The thing to remember is to try - as there are waivers for many situations. You may be told NO many times, but if you are an age that is close to being waived or wanting a job that is highly needed by the military, you may get your opportunity.